Physical characteristics: Red-crowned cranes, or Japanese cranes, have white bodies and bare red skin on the top of the head. This crane is about 59 inches (150 centimeters) in height, 15.4 to 22 pounds (7 to 10 kilograms) in weight, and has a wingspan of between 86.6 and 98.4 inches (220 to 250 centimeters). 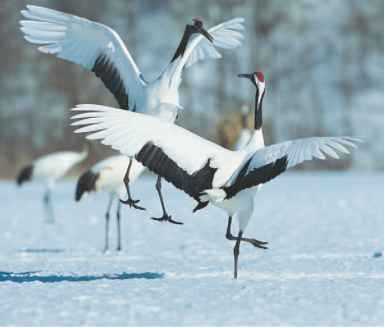 Geographic range: The red-crowned cranes are found in parts of China, Russia, Korea, and Japan. Habitat: The red-crowned crane is a rather aquatic species among cranes. It inhabits both freshwater and saltwater wetlands and marshes as well as some rivers. Diet: Red-crowned cranes eat a wide variety of items, including insects, fish, rodents, and plants. Behavior and reproduction: Red-crowned cranes are well-known for their elaborate courtship dances. 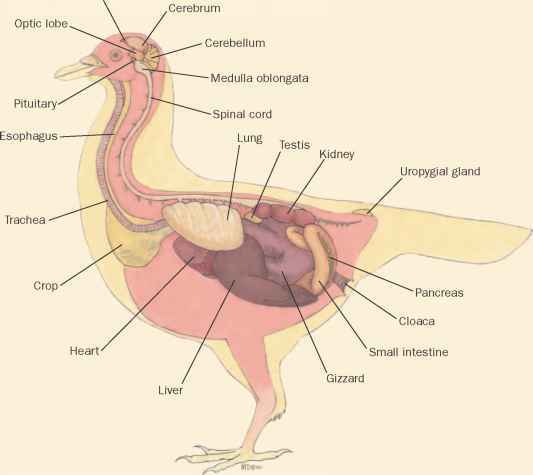 Generally, the female lays two eggs during the breeding season. Both parents incubate and feed the chicks after they hatch. Eggs hatch after twenty-nine to thirty-four days. The young are able to fly after approximately ninety-five days. Red-crowned cranes and people: Red-crowned cranes are considered sacred in many parts of its range in East Asia. They are associated with happy marriages, love, long life, and good luck. Red-crowned cranes have frequently appeared in East Asian poetry and art. "Cranes." Bird Families of the World, Cornell University. http://www. es.cornell.edu/winkler/botw/gruidae.html (accessed on April 5, 2004). "Family Gruidae (Cranes)." Animal Diversity Web. http://animaldiversity. ummz.umich.edu/site/accounts/classification/Gruidae.html#Gruidae (accessed on April 24, 2004). "Gruidae (Cranes)." The Internet Bird Collection. http://www.hbw.com/ ibc/phtml/familia.phtml?idFamilia=43 (accessed on April 24, 2004). International Crane Foundation. http://www.savingcranes.org/ (accessed on July 12, 2004).